eNLokam: India Pak brotherhood on Operation Table! Who said India and Pakistan are rivals? I think the rivalry only lies in the hearts of the politicians who always try to fish in troubled waters. Actually there is only friedship and love among the people...because Indians and Pakistanis are brothers! There are many such accounts that can be pointed out as examples of this feeling. To this list here is another one, a true brotherhood story. In this incident a group of Indian doctors and their Pakistani counterparts are the protagonists. The Indian doctors and Pakistani doctors jointly perform a complicated liver transplant operation for the first time in Pakistan. The living donor liver transplantation (LDLT), which is so complicated, was performed at Lahore`s Shiekh Zayed Hospital on 10th February 2011 by this team. LDLTs are "highly sensitive and complicated" surgical procedures as two lives - the donor and recipient are at risk. The joint operations were done by Indian surgeon Subash Gupta, a senior transplant doctor of Apollo Hospital, Delhi, and three of his colleagues and the three-member Pakistani team of Tariq Bangash, Khawar Shahzad and Umer Ali. The first liver transplant was performed on Khanum Maula and the liver was donated by his close relative Irshad Bibi. 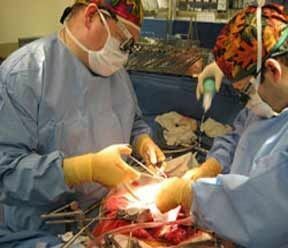 The second surgery was conducted on 45-year-old Abida Parveen and the liver was donated by her 19-year-old son. It took 12 long hours! I, personally want to hear this kind of positive news from either side of the border, and not about inflitration, scolding series by leaders, rivalry in sporting fields and the like. Let us live with absolute peace and harmony and that may not lead the innocent citizens ‘rest in peace’.